WJAR AM Radio was launched on August 2, 1922 by The Outlet Company, (department store) at 5000 watts on Channel 920, (kilohertz). The department store entered the radio broadcasting field to increase the sale of their records. During the 1970's WJAR was the flagship station of the Outlet Broadcasting Company. After World War II, The Outlet Company added WJAR-TV, initially operating from its downtown store building and later from a new facility on Dorrance Street. The radio station was spun off from the TV Station in the late 1970's and became WHJJ AM Radio. In the early days of radio broadcasting, listeners across the nation were fascinated with broadcasts from distant cities. Many cities had "Silent Nights" where local stations would go off the air to allow distant stations to be heard. It was in this experimental era of the 1920's and early 30's, when broadcasting was new, that EKKO stamps became popular. The EKKO Company of Chicago, Illinois came up with the idea of having broadcast radio stations provide Verified Reception Stamps to their listeners. EKKO provided an album for $1.75, which contained outlines of each of the stamps/stations currently available. The album contained a map showing the locations of the stations with blank spaces for additional new stations. There was also space provided to write down the dial settings at the time of reception. Proof of Reception Cards were provided with the album. Listeners would search the dial for distant signals waiting for the call letters. They would then look up the station address in the EKKO directory and fill out the card with the time and dial settings of the station heard and send it along with 10 cents to the station. The station would verify the card against their logs for accuracy and send the listener an EKKO stamp with the station's call sign on it. They frequently would also include letters and or station cards and other material with the stamp. I received the stamp shown above unused and not attached to a cover or card. EKKO collectors prefer them attached and they bring much higher prices when affixed to the original cover or card from the radio station. The stamps were produced by the American Banknote Company. A good friend of mine and fellow stamp collector and dealer, Joe Colello owns one of the finest collection of EKKO stamps and covers in the country - (originally the G. A. Vaughn Collection). He recently sent me a CD disk with an absolutely fascinating Adobe Reader slide show depicting the collection. 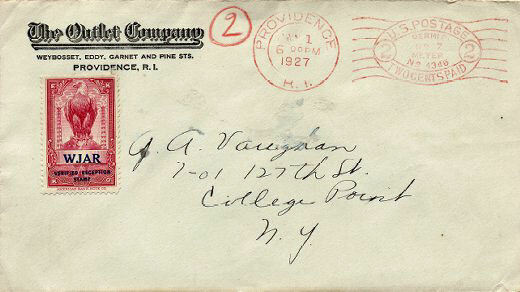 Vaughn logged and recorded remote radio stations on a two-tube radio from 1925 to 1938, collecting over 1000 verified reception reports from 15 different countries in various mailing formats including postcards, postal cards and letters. Joe has given permission to use one of these for this presentation and I found a WJAR Providence on Cover while browsing the disk which is shown below. The Manufacturers Outlet Company was started in 1894 as a discount menswear store by Joseph and Leon Samuels on Weybosset Street in Providence, Rhode Island. The company grew quickly, and expanded into a full department store with the construction of a new addition in 1903. The company began operating their own radio station, WJAR in 1922 and added a television station in 1949. The company acquired additional stores across the country and eventually owned 91 retail stores. They also continued to acquire additional radio and television stations. In 1980, the company sold their retail business to United Department Stores keeping only their broadcast business. They merged with the Rockefeller Group in 1984 as Outlet Communications and continued to operate WJAR TV until 1996, when it was sold to NBC. 1) AM, (Amplitude Modulation) is a method used to modulate a radio signal. The amplitude of the radio wave is modulated to be directly proportional to the value of the analog signal at the time. Early radio stations all operated in the AM Band, (typically 640 to 1600 KHz). 2) FM, (Frequency Modulation) on the other hand modulates the frequency rather than the amplitude. FM was originally assigned a frequency band of 45 to 49 MHz. The FM band was changed to 88 to 108 MHz in 1945 so that TV could use the 45-49 MHz band. As it turned out TV doesn't even use this band and it is now used for Police and Fire Band Radio. 3) KHz stands for Kilohertz and was previously called Kilocycles. For example: 920 KHz would be a frequency, (number of times the signal swings in a positive and negative direction) of 920,000 cycles.